Meantime, place oil and garlic in a large pan. Heat slowly over low heat, stirring until garlic turns pale gold, about 5 minutes. Remove immediately from heat. Do not brown. Drain spaghetti, reserving 1/2 cup pasta water. 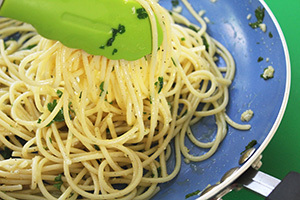 Stir spaghetti into oil & garlic along with parsley, salt & pepper. If it's dry, moisten with extra olive oil or a little pasta water. Top with Parmesan if you like. 5 Comments on "Spaghetti with Olive Oil & Garlic"
I used whole wheat spaghetti and I grated Romano cheese over it. Perfect with a couple of wayward cabbage rolls I found in the freezer. Garlic tip: buy a large bag of garlic, it’s cheaper, remove it from the store bag and put in a Ziploc bag and store in the freezer. The cloves peel easily while frozen, just trim the root end first. For the smaller inside cloves, just trim root end and squeeze them and they pop right out of the husk. It thaws fast, but you can slice or mince it quickly. When cooked it’s indistinguishable from fresh garlic. I don’t think it would work in anything using raw garlic, as it gets really soft. I enjoyed the dish, I used Wegmans organic basting oil with the 2 cloves of garlic,and added black olives and fresh shredded Parmesan cheese. For a quick Pasta, I cook pasta, place drained pasta in a bowl. I then add olive oil,to taste . I then add raw garlic to taste. I then add dried..parsley (crumbled by hand). I mix completely. I then add shaved parmean cheese on top , stir again. I then add crushed red hot peppers on top. Eat&enjoy! cn you figure out how to? years ago a friend used to make a 3 cheese, white wine, mushroom spaghetti sauce. It was fantastic but I can’t remember the proportions. All I can remember is you had to be ready to put it over the noodles quickly or it would gloop up. Your dish is a version of the Sicilian “Pasta con olio, aglio, e peperoncino!” (pasta (any kind) with olive oil, garlic, and red pepper flakes). I suggest adding a Tbsp of pasta water to loosen it. Top with Parmesan/Romano cheese!